A photo shoot of ice cream on a hot day is harder than it looks—or, should we say, softer? Art director Marc Kauffman scooped quickly while photographer Nick Sloff ’92 A&A snapped his camera even faster to capture the perfect Creamery cone for our July/August cover. 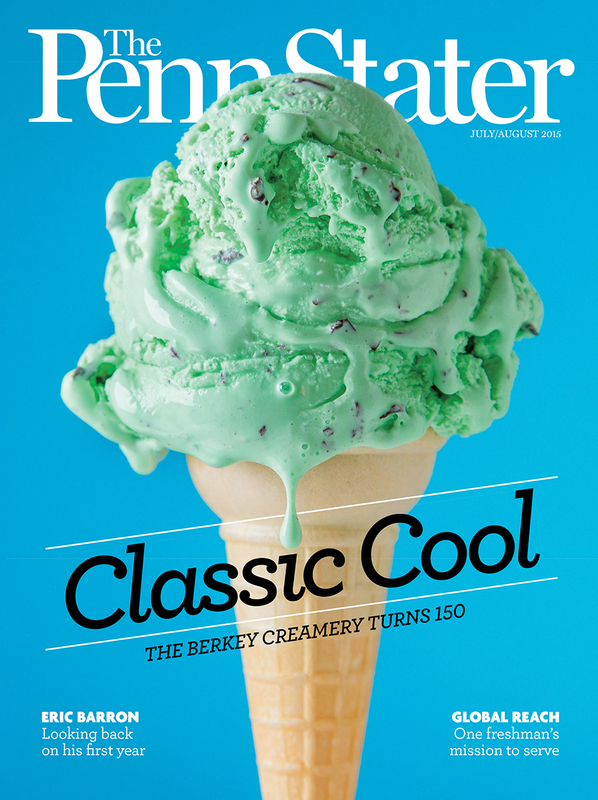 The issue, which should be in your mailbox soon, celebrates the sesquicentennial anniversary of one of the greatest traditions at Penn State: the Berkey Creamery. We look back at its storied history, plus learn about what’s in store for the next 150 years. Also in this issue is an interview by senior editor Ryan Jones ’95 Com with Eric Barron. The Penn State president reflects on his first year in office and talks about why he’s optimistic about the future of the university. Ryan also wrote a piece on philanthropist and freshman Neha Gupta in “The Unrelenting Power of One.” We discover that Gupta, who already leads an international charitable network, is just getting started. We also welcome the 79th president of the alumni association, Kevin Steele ’92 JD Law, on page 54. The Dickinson Law grad brings a decade’s worth of Alumni Association volunteer experience to the position. Another noteworthy story in this issue is on the late Fran Fisher. Read about how the Voice of Penn State Football was loved—and will be missed—by the Penn State community on page 24. There’s also a recap of the spring sports programs, which includes a national powerlifting title for Eliraz Katz. And, on page 18, find out what Joel Myers ’61, ’63 MS, ’71 PhD EMS has to say about his new AccuWeather television network. We’d love to hear what you think about the new issue. Drop us a line at heypennstater@psu.edu or comment below. Entry filed under: Uncategorized. Tags: Creamery, Eliraz Katz, Eric Barron, Fran Fisher, Joel Myers, Kevin Steele, Neha Gupta. There’s a Reason We Called Them a “Dynasty”	Have a THON Story?